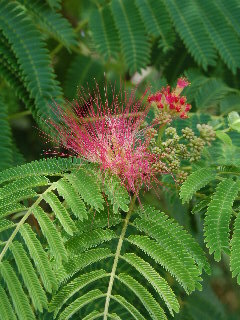 The mimosa tree (Albizia julibrissin) was introduced from China into the United States more than 200 years ago as a flowering ornamental. Today, the tree is widely spread over much of the country, particularly throughout the central and southern areas. Mimosa is one of those plants that has earned itself a place high on the list of love/hate relationships with members of the landscaping community. Some gardeners love its graceful form and beautiful blooms; others have a very definite “not in my backyard” opinion. And, in fact, some individual gardeners who are fans of mimosa are torn trying to decide whether the pleasure is worth the pain. Let’s take a look at what all the fuss is about as we go through a brief discussion of the pros and cons of adding a mimosa tree to your landscape. First of all, what’s to love about it? Mimosa is a gardener’s delight in that it has its own unmistakable appearance, not only in its spreading canopy-like structure, but also in the unique delicately feathery blooms and its unusual fern/palm-like leaves. 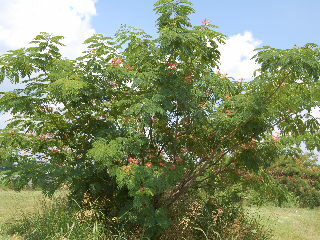 Young mimosa trees, once they take hold, will begin to flower fairly early in their lives, sometimes as soon as their second or third growing season. As the tree matures, a healthy mimosa will generally produce a profusion of blossoms that will last for several months throughout much of the warm growing season. Not only are the blossoms attractive to the human eye, but the bees, butterflies, and hummingbirds also seem to delight in close inspection of said blooms, as well. The pink blooms are delicately fragrant, but owe more of their popularity to their visual appearance. Mimosa trees are generally quite easy to acquire. I have seen them offered for sale by respectable garden centers for a “reasonable” retail price. However, my guess is that the majority of mimosa trees are procured from friends and fellow gardeners who have a flowering mimosa tree in their own yard and are happy to dig up and contribute a young seedling which has sprouted from a wayward seed generated by the mature tree. Which brings us to what’s to hate about mimosa trees? That single seed that germinated into the young tree your friend gave you has lots of brother and sister seeds that will produce lots of other seedlings, often in unwanted places such as your (or your neighbor’s) nicely manicured lawn or cleanly mulched flower bed. Mimosas are undemanding of soil requirements, and can crowd out other possibly more desirable vegetation. Mimosa trees tend to be somewhat short lived (generally 20 to 30 years tops), and the wood is rather weak and can split and break as the tree ages. Also, this tree is subject to various diseases and viruses which can weaken, stunt, or impair it's health and beautiful appearance. To be considered, too, is the fact that mimosa is a deciduous species, so those lovely green, delicate, unusually shaped leaves will turn brown and have to be cleaned up after they tumble to the ground. And so goes the resume’ for the new applicant you might be considering for a position in your landscape. My suggestion to you is to go ahead and hire this candidate! The delicate beauty and unique characteristics of the mimosa tree far outweigh any problems you might experience.